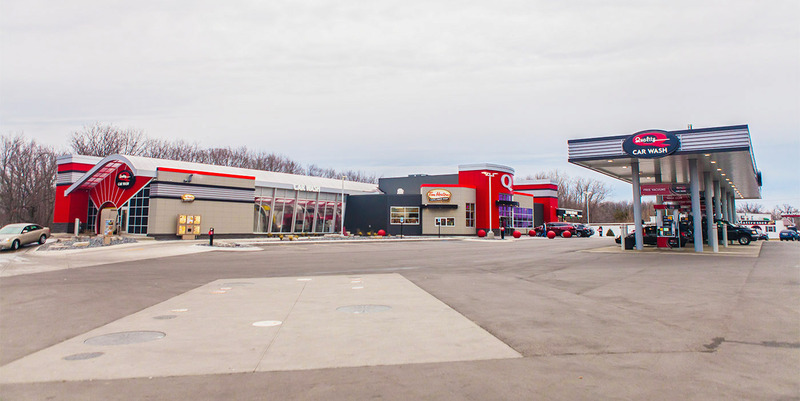 The Gas Wash C-store model integrates up to 4 profit centers with fuel sales, a convenience store, car wash (Mini, Express, or Flex), and possible affiliate coffee shop or restaurant. More services attract more customers and ensure long term growth across all services. Gas sales drive consistent traffic and promote car wash frequency. 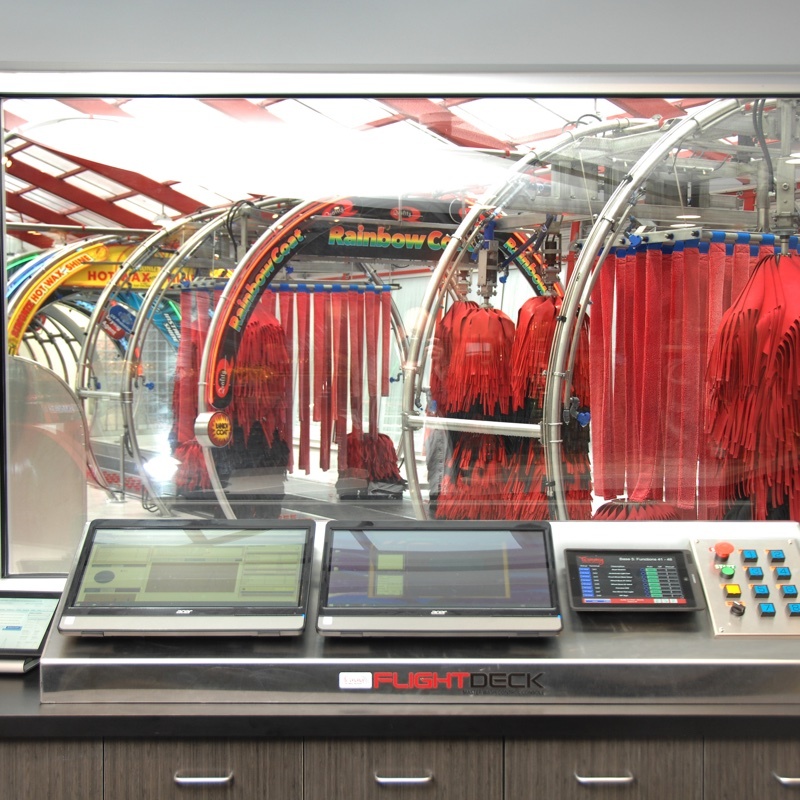 The Flight Deck system allows as few as two cashiers and a teller to simultaneously operate the fuel service, convenience store, and wash - minimizing operating costs. This design takes our signature Totally Tommy style and carries it through the Gas Center, C-Store, and Wash to create a consistent look with welcoming flair. The primary tower anchors the facility and houses a critical innovation we call the Flight Deck. The tower is optimized as a control center for the entire facility with strategically designed doors and windows to promote easy operator access, visibility, and management. The Flight Deck facilitates easy access to the most labor-intensive areas of the wash, allowing cashiers to reach the pay queues and loading zone in seconds while also monitoring and controlling the entire wash bay. Clear lines of sight are an important and often overlooked element of site management. The Flight Deck features an angled panoramic window for vision of the entire tunnel, complementing strategically placed security cameras. Our proprietary point of sale system utilizes off-the-shelf components for reduced operator cost. 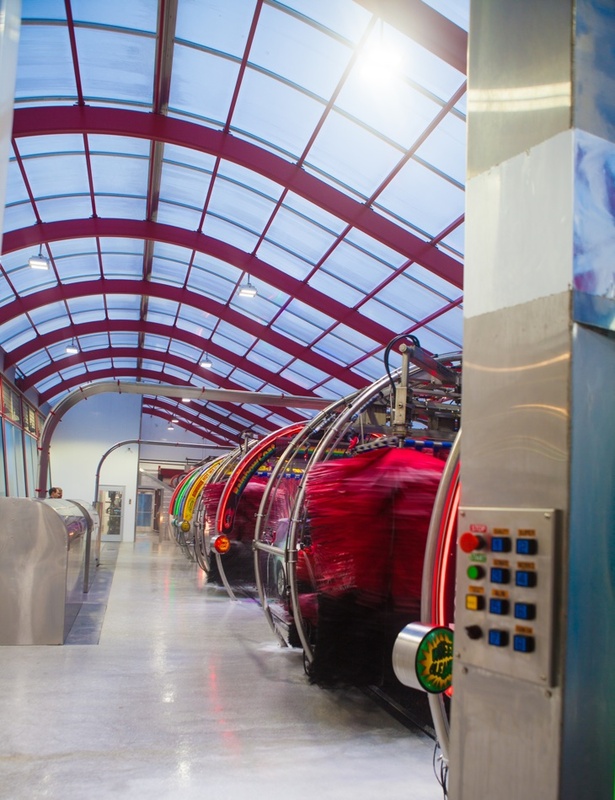 Fast and flexible, the system supports the Wash Club program and lightens the load on staff members through automatic club member lanes. The owner’s suite is a highlight for many operators, and offers 250 square feet of quiet office space, separate from the manager’s office below. Furnish the space to your preference and take advantage of the room for staff meetings or office work. The secondary tower is built slightly smaller than the primary tower to differentiate all 4 sides of the building, but serves an equally important function as a storage center. 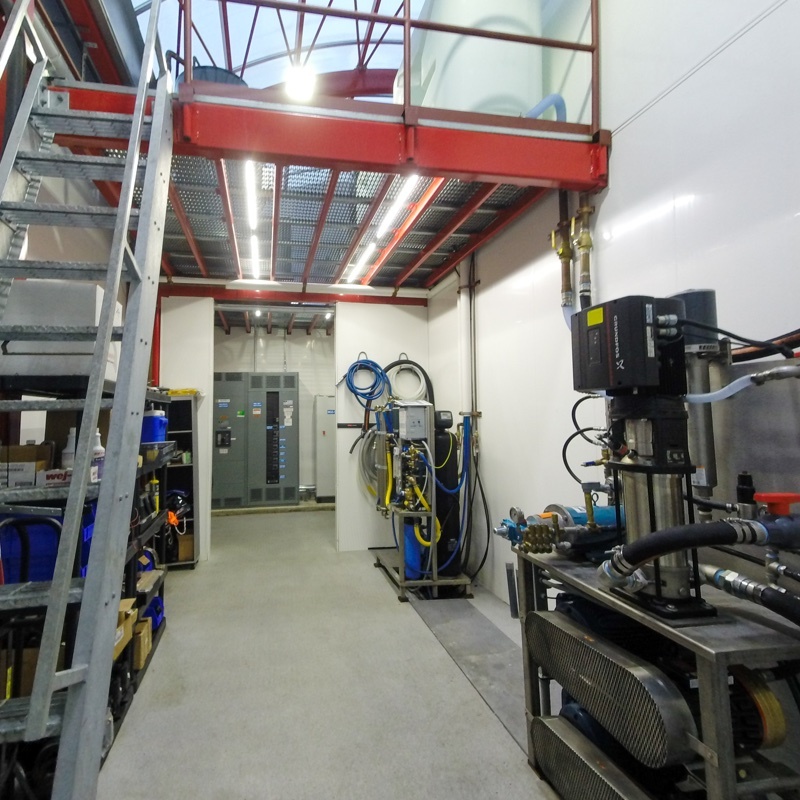 Detergents, parts, and supplies all have designated storage spaces and the tower includes a second level mezzanine area for seasonal marketing supplies and equipment. For easy service and maintenance access the storage tower opens to both the wash bay (specifically the blower room) and the vacuum area on the exterior of the building. 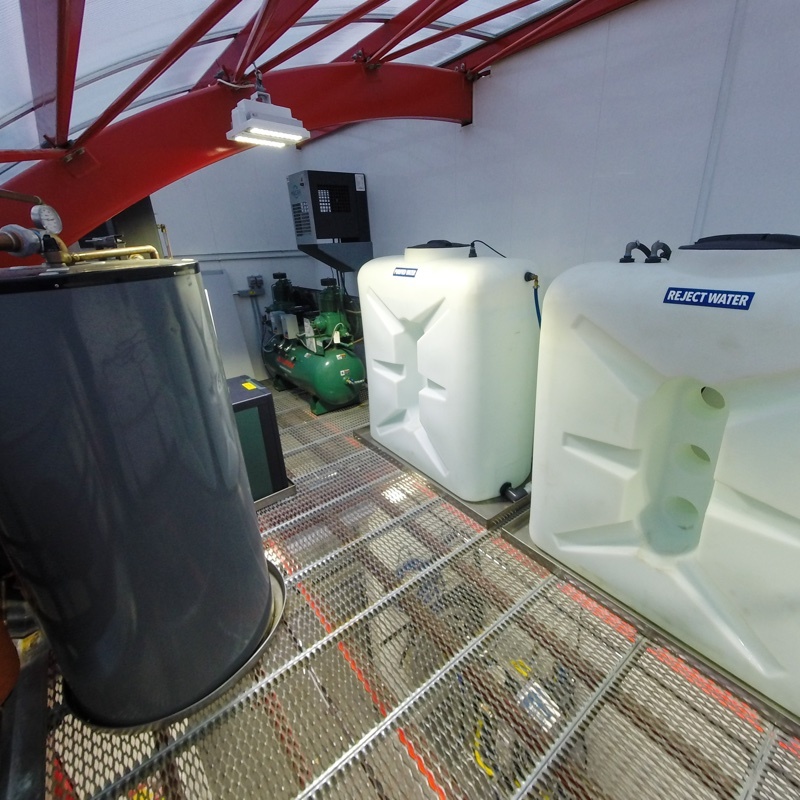 In conjunction with the POD system, the storage tower stays available for detergent drum storage to keep your wash working longer between deliveries. The wash towers offer ample square footage for large custom signage. 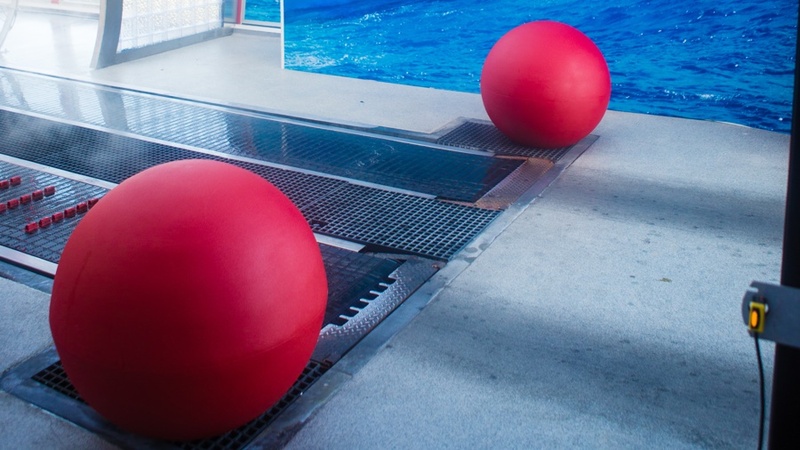 Complement your branding with available red, blue, or neutral color schemes and other exterior accents. 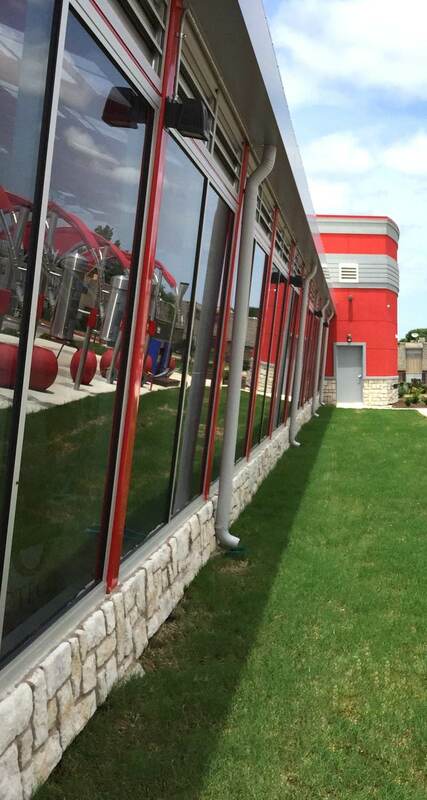 The building comes standard with three pay lanes, each serving a specific function, and a three-lane canopy overhead. We supply everything from the canopy itself the lighting and menu signage below. 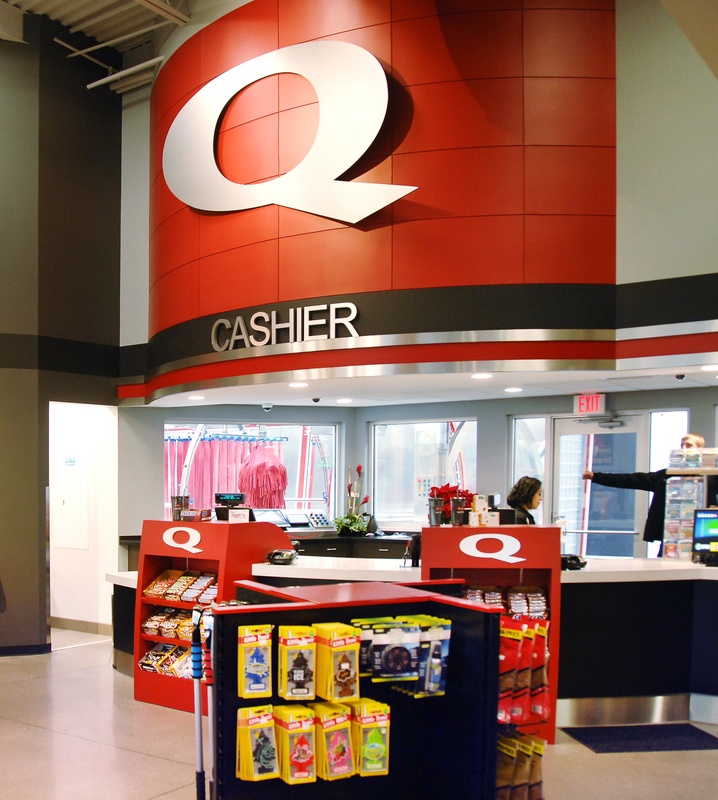 The cashier station is where customers come with questions, to purchase single washes or gift cards, and to learn more about club memberships. The lane comes equipped with a license plate or RFID reader for club member processing. The second lane may be equipped with an auto cashier terminal, able to accept cash or credit for single wash purchases. The lane is also able to admit club members or app sales via a license plate scanner or RIFD reader. The third lane is marked for Unlimited Club Members only and typically does not include an auto cashier station. The dedicated lane shortens wait times for Club Members and serves as an exclusive members-only benefit and selling point. Totally Tommy washes are all LEED certifiable, and are built from the ground up to be eco-friendly. To promote sustainability we use recycled materials for our buildings. Translucent roof materials eliminate the need for electric lighting during 90% of open hours, while also creating a bright, open environment for the wash tunnel. All lighting at the facility is integrated into one cohesive system, so that you can easily monitor and manage your energy usage throughout the day. Most areas in the wash tunnel are unmanned and need no temperature control, reducing energy usage and costs throughout the entire year. 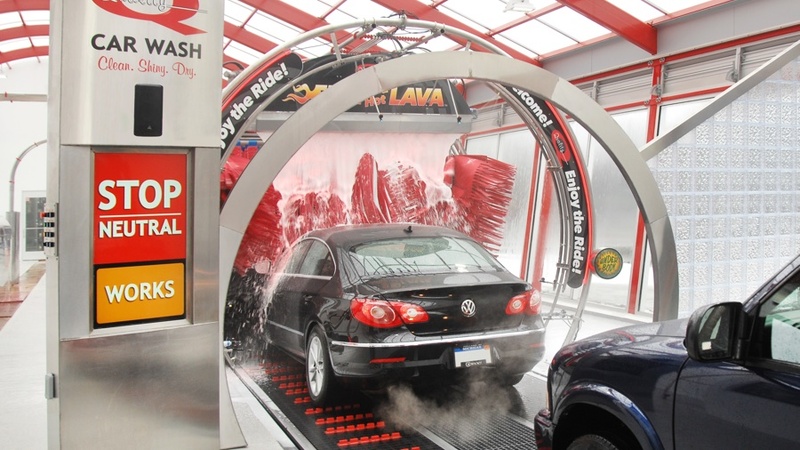 What started as hypothetical experiment in custom car wash design more than fifteen years ago resulted in a transformed wash bay environment. By fixing the dimensions and fine-tuning our engineering we've brought acrylic roof costs down to compete with traditional roofing materials without sacrificing our signature look or performance. Our wash design offers a low stress experience with natural light, open space, and no clutter. 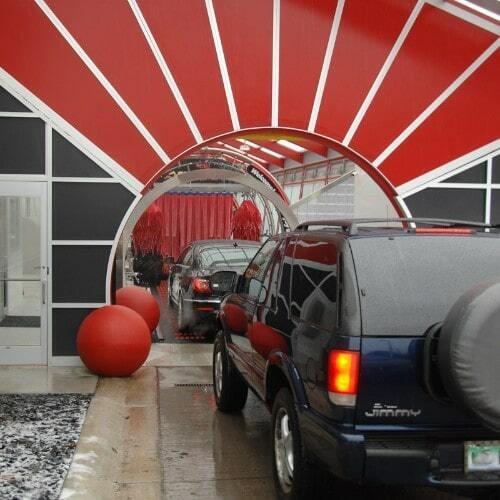 Few other car washes can compete with the comfort customers experience sailing through a Totally Tommy tunnel. Townships and cities love that our buildings are designed with environmental concerns in mind. We make use of natural light during the daytime hours, reducing your energy footprint and saving money. Acrylic is sturdy and relatively inexpensive, and endures the test of time longer than concrete or metal roofing which can break down given the extreme humidity of a car wash. The building incorporates an optional roof vent that opens down the center of the wash bay to release heat on hot days. An optional material called Heat Stop can also help keep the bay cool in direct sunlight without blocking natural light. 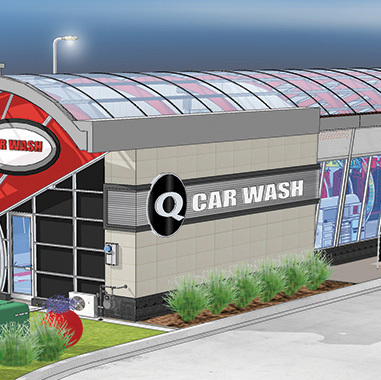 The building incorporates a 10' canopy over the entrance and 5' canopy over the exit to signal transitions and offer shade as the customer enters and exits the wash bay. Customers love their cars and hesitate to trust them to 'black hole' carwashes. 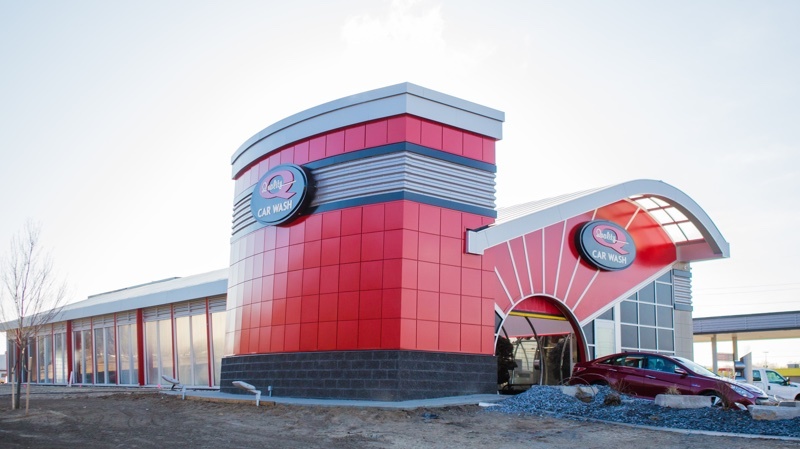 We signal that our design is safe and well-engineered by opening up our tunnel car wash with full-length bay windows and large entrances. We call it the microbrewery effect and it gives you the chance to showcase your wash and stainless steel arches for every future customer who drives by. Our window design features high windows for a panoramic view in and out of the tunnel, relaxing claustrophobic customers during the wash and making oversight and facility management easier. Our unique mullion design puts the bulk of the building's frame outside, leaving a low profile inner frame. This results in a seamless interior surface, so your window cleaning can be finished in under 15 minutes. Your equipment is some of the finest in the world—and it’s worth showing off! Highlight your facility and equipment, and let customers look in to drive interest and wash counts. Our vaulted side walls break the shoebox mold, giving you a unique style that supports your brand and separates you from the competition. 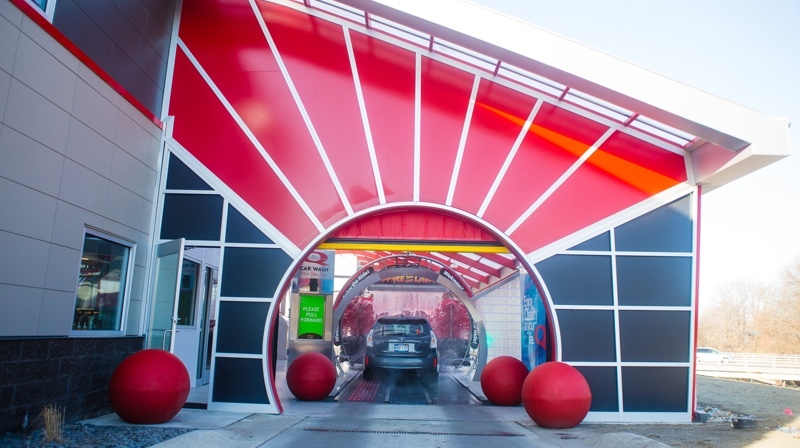 Once your customers try a Totally Tommy Express Tunnel, other auto washes just don't compare! 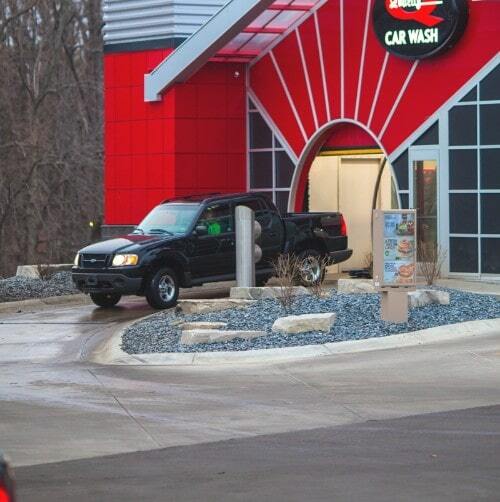 Just because boxy automatic car washes are everywhere doesn't mean they are well-loved. Outclass and outcompete those mini car washes of the past with our signature system and style. Our designs may be unique, but that doesn't mean they're complicated or difficult to maintain. We've worked hard to use standard components wherever possible to reduce the complexity of our design and lower maintenance and upkeep costs. Shoebox washes don't capture people's attention or respect. Our buildings are bright, colorful, and command attention, driving increases in your wash's capture rate and customer loyalty. In every car wash there are electronics and other equipment that can't handle the high-moisture content of the rest of the wash. Our dry backroom securely consolidates this electrical gear and equipment in one close, in-house location. The lower level of the dry backroom stores electrical services, pump station equipment, and the reverse osmosis unit as well as daily cleaning supplies and parts shelves. The mezzanine level holds the reverse osmosis water tanks, air compressor, and optional hot water heater, all easily accessible via a low profile ladder and railing. The expansive surface area on the towers and dry backroom walls allow for larger branding and advertising space so that you don't need to rely solely on roadside signage to attract customers. The starburst pattern featured on both the entrance and exit lend a showroom-shine effect to the car wash and its result. The circular theme persists throughout the facility from the arches to the vacuum stations. The Tommy Transporter is a tremendous improvement over old-fashioned roller systems. We never scratch a wheel or intimidate a customer by jolting them around as they line up. Loading is as simple and low-stress as pulling into an average-sized garage and shifting in neutral. A Tommy facility saves operators an average of $62,000 per year thanks to automated loading. The process is so natural that customers quickly self-train and rarely require assistance, in large part thanks to our bright, all weather instruction screens. Self-loading systems require clear, responsive instruction in order to reduce error and guide the driver into the tunnel safely and efficiently. Our entrance module provides clear and specific wording to do just that, focusing the customer's attention in one place as they load. The Totally Tommy Gas C-Store Wash is built around a modified version of our flight deck that also serves as the cashier station inside the convenience store. 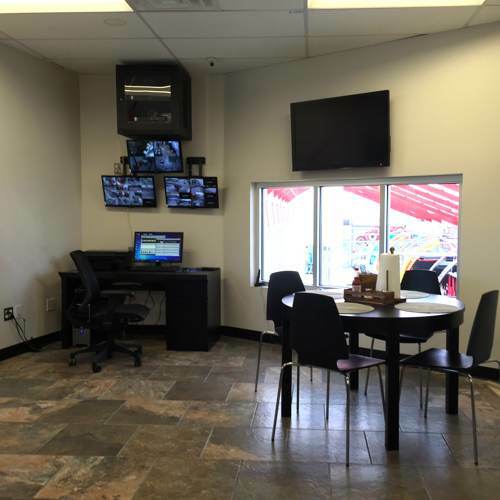 This setup provides streamlined control and observation of the wash and loading areas while also giving operators a great view of the fuel stations as they provide cashier and customer services—a cost-saving system we've perfected over the past 45 years. 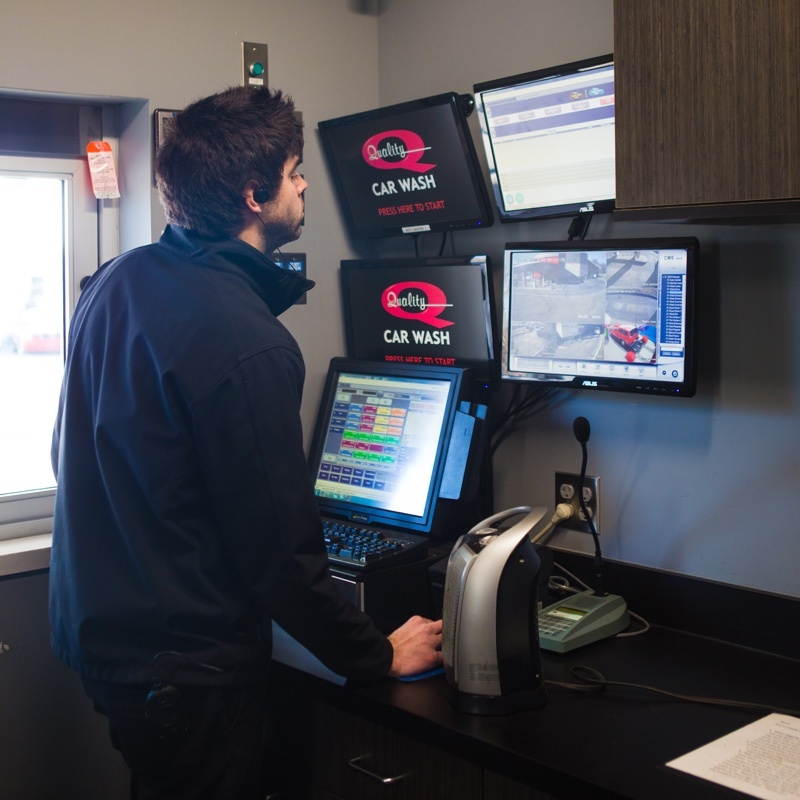 The gas station cashiers are strategically placed in a line with the car wash loading lane, so that staff can share different roles and quickly spot trouble and intervene if a customer needs assistance. 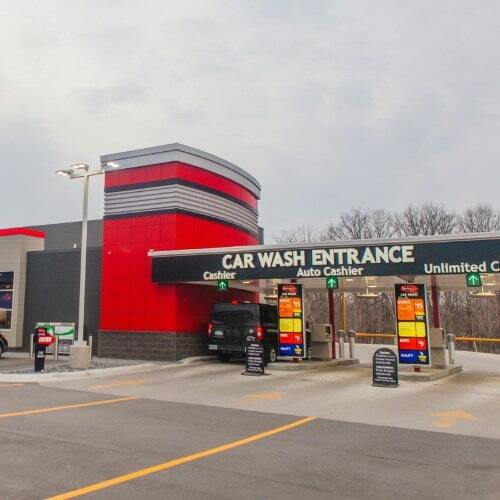 Unlike your average gas station car wash, the Totally Tommy Gas C-Store Wash setup has the interior of the wash connected and visible through large glass windows behind the cashiers in the convenience store, beautifully showcasing the wash to every customer who steps in. Black hole automatic car washes are everywhere but that doesn't mean they work well or have been particularly successful. With a Tommy Express, Mini, or even Flex attached to your Gas and C-Store you'll have a high quality, attractive wash that adds value and builds customer loyalty. When it comes to coffee runs and quick meals, customers form strong loyalties and are more willing to trust and visit brands that they know and recognize. While we've opted for unbranded fuel in our corporate store, we’ve found that partnering with a well-known franchised coffee shop or restaurant has a dramatic impact on sales and capture rate. 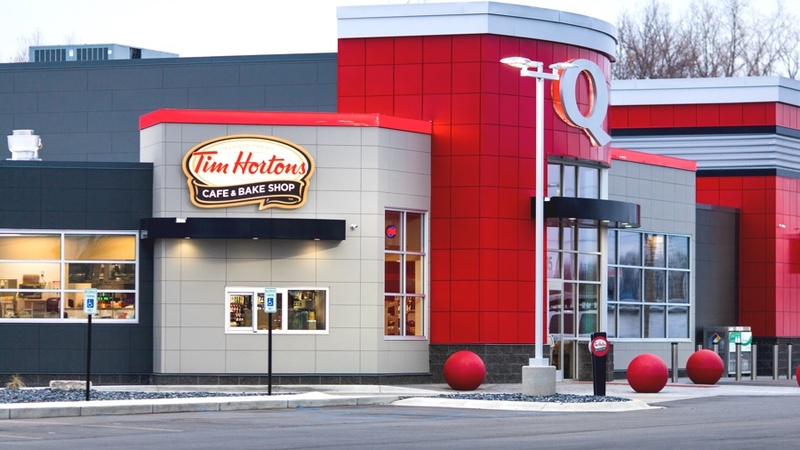 Our layout is modified to include an additional drive-thru for a coffee shop franchise or another profit center like ice cream, pizza, or fast food service. We designed our convenience store layout to feel warm and open so customers don't feel like they are eating in a gas station. 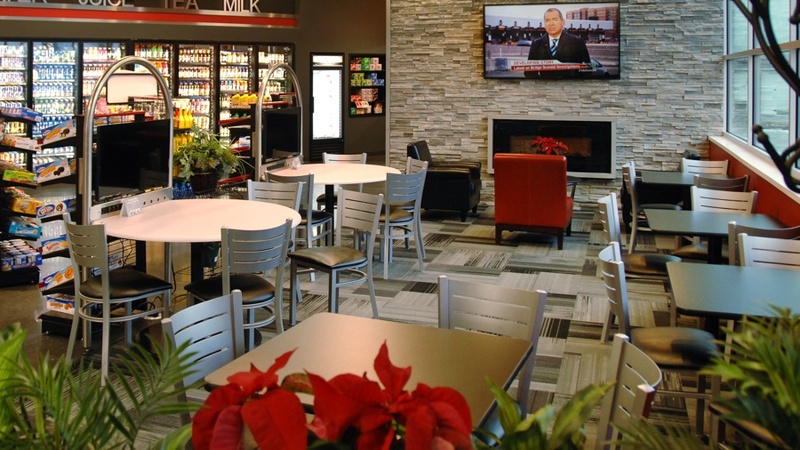 We include a fireplace, TV, and lounge furniture for a modern coffee shop feel. Site layout is a breeze with Tommy Car Wash Systems! We have eight distinct layout options to suit different lots with respect to orientation and flow of traffic, so your wash looks good and functions smoothly whether you are on a busy corner or mid-block lot. Our designers are able to provide a full 3D model of the facility as it will appear on your particular site for you to share with investors and contractors as part of the construction and planning process. 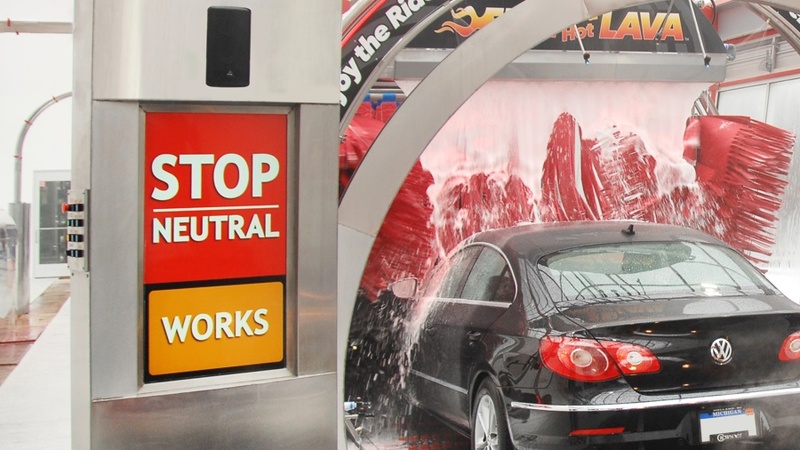 Every car wash site is different and changing designs to fit different roads, highways, intersections, and lot orientations can make car wash design costly and time consuming. But not with Tommy Car Wash Systems! We've spent time planning out the optimal drive and building layout for every common street and corner placement and we've made sure that our design looks fantastic and welcoming from every angle. If we wanted our design to go worldwide, in all kinds of lots, climates, colors, and cultures, we needed a design that would look good from every side. With the Totally Tommy site lineup we have designs that look great just about everywhere, no matter which direction the customer is coming in from. Customers often see this angle, which we call "the good side," as they enter from a secondary service drive in the back of the wash, or if the facility is built with frontage along a highway. This side we refer to as "the other good side". Customers view it from the road at certain intersection layouts or along highways where an entrance is again located along a service drive. Customers approaching the facility from a standard direct entrance will see this dramatic view of the wash exit, with special attention drawn to the storage tower above. This is the view of any customer on approach to the point of sale area. The towers stand at different heights with different footprints, creating a unique and stunning visual field across all four corners and helping direct visitors to the pay lanes located below the highest architectural point. 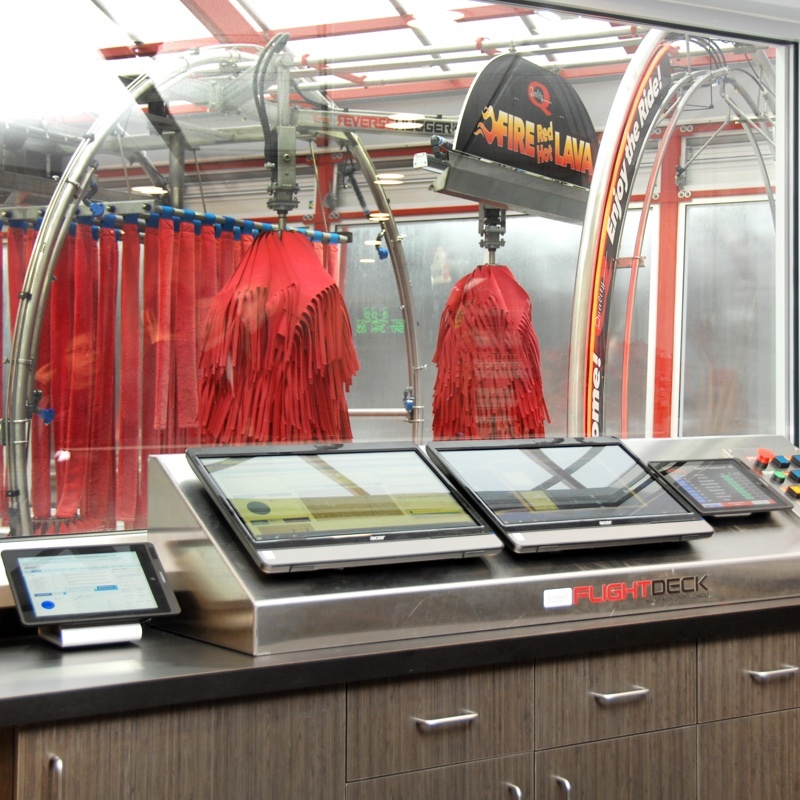 A great car wash needs a highly visible, intuitive point of sale and loading area that customers can approach without confusion or hesitation, and our designs make it happen. 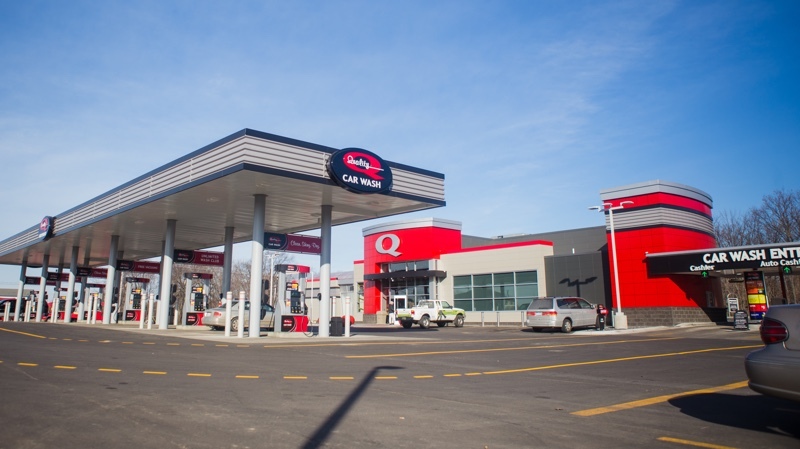 Our standard three-lane setup divides traffic to keep customers moving and the points of sale are well-marked by signage, the main tower, and custom canopies. The loading turn naturally buffers customers after the payment process, comfortably spacing vehicles as they enter the conveyor during peak hours, no supervision needed. The Down In, Down Out principle developed by Tommy Car Wash Systems incorporates precisely graded slopes to ease motorists into position during loading and unloading. 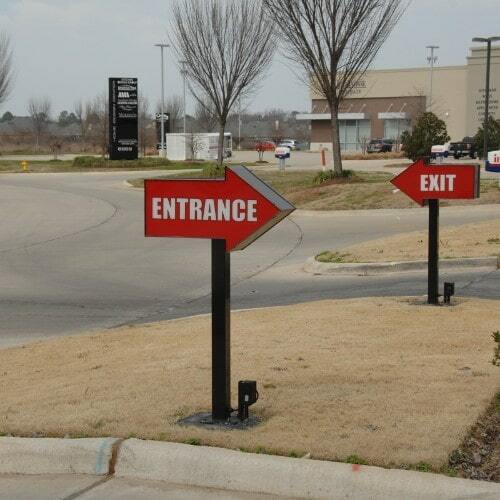 Consumers are used to drive-throughs that feature left hand turns, so we centered our design between a comfortable right side entrance lane and left side vacuum area. There is an extreme WOW factor that comes with our tunnel's look and scale, and that wow factor translates into a significantly improved capture rate and better ROI. We believe that it is always best to build at least (and not more than) 12 inches higher than street level to elevate the property's visibility and improve drainage during heavy rains. Traffic flows smoothly in the right and out the left, just as with all major fast food restaurants, banks, and other drive-up services. This simplifies navigation for your customers and prevents bottlenecks. We create berms in the landscape to lend a sense of height and depth to the facility, resulting in a warmer and more complex feel for customers navigating through the wash.
We've built over 250 washes, but our Gas and C-Store models have been some of our most successful, hands down. 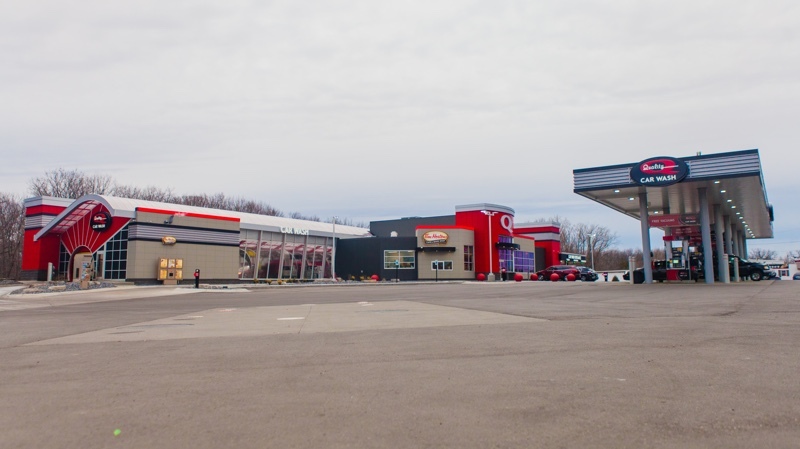 Expect very different cost and land requirements depending on which type of wash you choose to build with the c-store and fuel station, with our Flex and Express models requiring the greatest cost and space and our Mini requiring a smaller space and a lower cost. 130 ft. for Flex / Express.